The post lists down the rate of interest on Bank fixed deposits for Senior Citizens as of December 1, 2018. You can fill Form15G/H if you want to avoid TDS. The highest interest rate is offered by IDFC Bank (3 years 1 Day – 10 years) at 8.75%. The highest interest rate is offered by Indus Ind Bank (270 days to below 1 years) at 8.00% . The highest interest rate is offered by Lakshmi Vilas Bank (450 Days) at 8.60%. RBI on September 2015 had granted licence to 10 Small Finance Banks. Lately these banks have been in news for offering higher interest rates on their fixed deposits as compared to regular banks. The table below compares the interest rate offered by Small banks. The difference is substantial for low tenure deposits – Fincare Bank offers 9.5% for 24 to 36 months deposit while SBI offers 7.3% only. You are doing a great job. Thanks a lot for your help. But, I have a small concern. FD for Senior Citizen in Karur Vysya Bank (KVB) starts from 1 year (there is no scheme < 1 year) and interest rate is 7.25% (since 2017). I think most of the interest rates you mentioned in this blog are not matching with actual Interest rate from Bank portal. As you mentioned, KVB – 91 Days to 180 Days, interest rate is "7.40%". KVB has never revised their Interest rates since 07.05.2017 as per their portal. I am not sure from where you got this info bec. this blog was last updated on 01 Apr 018. I/we usually follow your blog without cross checking, bec. we blindly believe in you. If possible, I would like to request you to ensure your data is correct and not misleading others. Thanks for your appreciation and feedback! We had automated picking up interest rates from bank websites recently and I think its not working the way it should. We will look into the same. Also KVB does offer FD for all duration to senior citizens, its just that it does not offer any extra interest rate for other than duration mentioned! 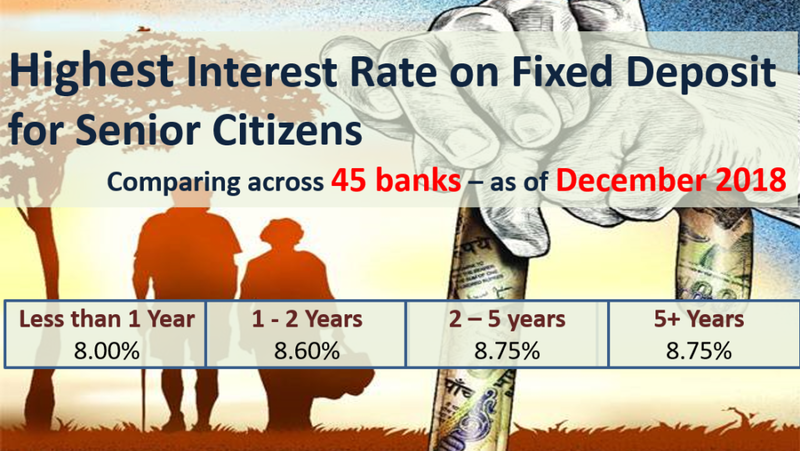 So for less than 1 year FD the interest rate would be same for general public & senior citizens. Also as interest rates change frequently, you must check respective websites before investing (this is true for any website including ours). We would make the required changes by next week when we put interest rates for May 2018. Can my father get benefit of 80ttb? I have a query as sr citizen. I have already invested in SCSS deposit with bank. Can interest on same be included under section 80TTB for exemption upto Rs 50,000 ? The interest rates are slowly going down to the lowest level every year. Number of senior citizens are fully depend on the income from their FDs only. I do not how the senior citizens are going to survive if the interest rate goes on reducing in the name improvement in the financial improvement to the country. However requests to consider for the senior citizens case which should be increased to 9% minimum otherwise their survival will become a question mark . I totally agree with you and know this would make many senior citizens retirement plan go awry. But this is the new reality and people have to adjust to the same. Government would really not do anything until people unite and it thinks that its impacting a major vote-bank. However would recommend to put some money in long term equity funds and also start SWP in debt funds as its more efficient than Fixed deposits! As a private employee retired,have no pension scheme.Using LIC various schemes and Senior citizen schemeFDs (maximum ltd to fifteen lakhs).I would like your advise on investing apart from Bank Fd(for senior citizen) where interest is drastically coming down,where can I invest so that you get reasonable return.please advise. Dear sir, my father is a senior citizen he want to invest scss in ( andra)bank & from the interest come from it he want to invest in a rd in same bank.Do you think it is a good decision. Or he invest rd in another bank which offer extra rate of interest. It would be better to invest in bank offering highest interest rate but the problem is SCSS interest would be auto-credited in Andhrabank savings account. So transferring the same to other bank and then investing in RD might be cumbersome (though its just 4 times a year). So yes go ahead with your plan of RD with Andhrabank. Repco bank offers 8% for one year and above for senior citizens. Pl check up. Thank you for pointing this out – have made the changes! Dear Amit, you are doing a great job. Keep it up. By the way, in the last table, the max. FD int. in Axis Bank is shown as 7.5%, but in an earlier table on this very page, the int. for FD of 14<15 m. is shown as 7.60%. Please correct it. Dear Amit, sorry for that earlier post. Please treat it as withdrawn. I could not see your reply to m.k.jaura’s comment due to some glitch. I am sorry to say that these are obsolete rates no longer valit. Latest rates are lower. Please up date your data so that the invester is not misguided. Sorry for the inconvenience – we have updated the fixed deposit interest rates here. I suppose there has to be an extensive study before stats are pur out esp. with reference to Ratnakar Bank. If you could check Varacha Bank, Surat Peoples Bank, Sutex Bank, Sarvoday Coop Bank ( all coop banks in Surrat) whose financials are available and NPAs are available for view. These give better returns than Ratnakar. Also, see Gujarat Rajya Karmachari Coop Bank. Investments upto Rs. 1 lac is insured. Also, the investor needs to be educated on the maneouveing of applicant names while opening accounts with coop banks, so that only the benefit of sr citizen is obtained, but the deposits are also insured. I agree with your views and you can use various combinations of names of account holders to get benefit of deposit insurance. Historically co-operative banks have been riskier and so they offer higher interest rate. Also claiming insurance in case of default is not easy and it may take time. So it’s individuals call weather to take risk for slightly higher interest rates.